He shall be responsible for proper operation of the gate as per SWRs for the passage of trains. He shall ensure that no train suffers any detention on account of late closing of the gate. He shall keep the channels of check-rails clean and shall clean the road within the railway limits and water the area regularly. He shall clean the gate lamps and hand signal lamps daily. He shall ensure that the wicks of the burners are trimmed so that these are lighted properly and kept burning continuously from sun set to sunrise. He shall obey all lawful orders of the ASM on duty or official in-charge supervising the shunting during the course of shunting operations including coupling or uncoupling of vehicles of wagons. Fixing rubber washers, closing wagon doors, displaying hand signals etc. He shall exhibit danger signal to the official supervising the shunting should the crossing be fouled during the shunting operation. He shall pilot the trains in case of abnormal working and when ordered by the SM on duty. When on duty or when called upon to do so, in case of emergency, he shall be responsible for obtaining and granting line clear to trains or for shunting movements as per SWR & GR. He shall handle the control panel himself when on duty and shall not permit any unauthorized person to manipulate panel. He shall keep the SM’s control keys of control panel in his personal custody whenever, he is required to leave his office even for a short duration. He shall handle the block instrument himself when on duty and shall not permit any unauthorized person to manipulate or handle the block panel/block instrument & block telephone. He shall keep the Station Manager’s control keys block instruments in his personal custody whenever, he is required to leave his office even for a short duration. He shall deal with public complaints and counsel commercial staff for courteous behavior. He shall ensure right time placement and removal of terminating/originating trains and keep records in this regard and also keep a watch on Shunting operations. ii. Ensuring that the general working of the Station is being carried out in strict accordance with the current rules, procedures and instructions. iii. Providing prompt and courteous service with utmost safety and security of passengers and employees. 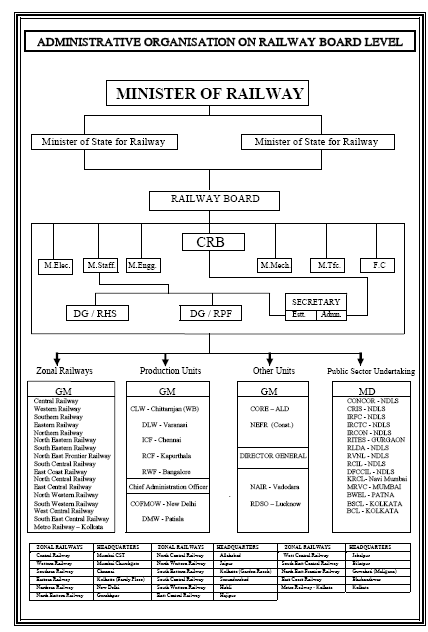 Hierarchical set up and line of control of Operating Dept, at the Divisional, Zonal and Railway Board level.